A really good day today! Starting off check-in welcoming a new member, Chris, and welcoming back our friend Jason. We shared how we felt and the things that seem to be overloading us right now, and as usual the support of the group helped big time. You can put all the stress to one side and just enjoy the surroundings and people, leaving the troubles outside the entrance to the site. Trust, acceptance, safety, a place to be yourself. Then we set up our celebrations for Hils’s birthday! Sharon’s lemon drizzle cake, balloons and banners, flowers and lush presents. Special wishes for a special lady, one who throughly deserved totally pampering and love. 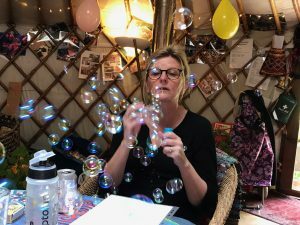 Also bubbles for each and everyone one of us – the yurt was soon filled with the ephemeral little spheres of translucent joy and laughter. Chris was taken on a tour of the site whilst three of us cooked lunch – a lovely meal was shared in the yurt. Then to work, being busy planting out our new vegetable garden! Carrots, cauliflower, chard, squashes, purple sprouting, tomatoes all planted out from plugs, seeds planted to grow beetroot in our little greenhouse and tons of watering!!!!! 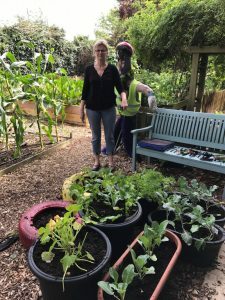 Dirty but satisfied – feels like Greencare is Growing again! And lots of potential soups for winter. One member had to leave early but the rest started spitting cherry stones in Hils’ honour – winner was Chris by miles 🙂 Then back to the yurt for a cup of tea and writing this blog, and check out!